The name given to the Seker Boat is “Ḥennu,” , and it is mentioned several times in the Book of the Dead, and sometimes in connexion with traditions of great importance. [Page 506] Thus after the lxivth Chapter we have a rubric which states that the composition was found in the masonry below the shrine of Ḥennu during the reign of Semti (Hesepti) a king of the 1st Dynasty; now Ḥennu can only be the god of the Ḥennu boat, and the shrine of Ḥennu must be the place where it was kept. A most valuable proof of the antiquity of this boat is found on an ebony tablet in the British Museum which was made for the royal chancellor Ḥemaka, who flourished during the reign of Semti, whose Horus name was Ṭen. On this we see a representation of the king dancing before Osiris, who is seated within a shrine on the top of a flight of steps, and in the register immediately below it is a figure of the Ḥennu Boat. The Seker or Ḥennu Boat was probably a form of the Sektet Boat, i.e., the boat in which the sun sailed over the sky during the second half of his daily journey, and in which he entered the Underworld in the evening, for Rā the Aged, is said to be like Horus, and Rā the Babe, to be like Seker. 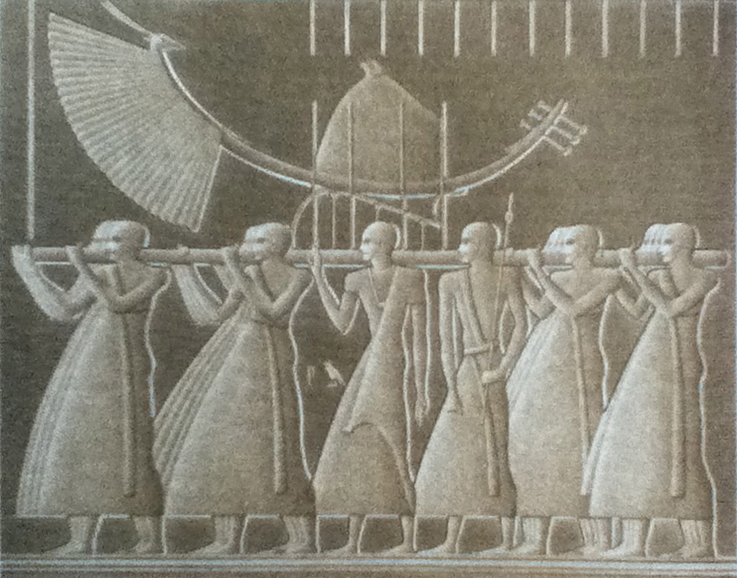 The sanctuaries of Seker must have been extremely numerous in Lower Egypt in very early dynastic times, but it appears that before the great development of Rā worship took place, the god Seker was already identified with and merged in Ptaḥ, and that these gods were adored together in one temple. The forms in which Ptaḥ-Seker is represented are interesting, for they illustrate the attributes of the double god, and prove that it was Ptaḥ who usurped the characteristics of Seker, and that Seker was the older god. In Egyptian mythology, the hennu boat (also henu, Manuel de Codage transliteration: Hnw) was a symbol of the god Seker of Memphis. Depending on the era or the prevailing dynasty of Egypt, the hennu boat sailed toward either dawn or dusk. In the Pyramid Texts of Unas (PT 214, 138c) one of the steps the deceased had to take, after leaving his property to his son, after purifying himself, etc. was: You will descend on ropes of bronze, in the arms of Horus as his name is "Being in the Hennu barque." On the holiday of the god Seker, a stone—possibly a representation of the god—was put on the Hennu barque and pulled with a sled over the fields, while people followed it wearing garlands of onions. A harpist's song from the tomb of Djehutimes (TT 32) describes the practice as follows: [He] pulled [So]kar by placing the Hennu barque on its sled, going around the walls with his following.